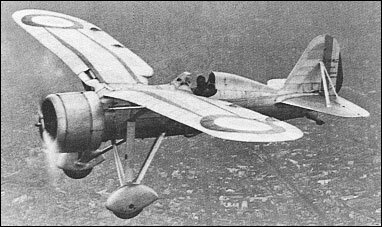 Built as a replacement for the Loire 43, the Loire 45 employed a fundamentally similar airframe, but was fitted with an 800hp Gnome-Rhone 14Kds 14-cylinder radial air-cooled engine and had more robust wing bracing struts. Flown for the first time on 20 February 1933, the prototype was transferred to Villacoublay in June for official testing. During the course of trials several modifications were made to the wing roots in attempts to improve visibility from the cockpit, an 880hp Gnome-Rhone 14Kcs was installed in August 1934, and, in the following October, the vertical tail surfaces were enlarged. Armament comprised two 20mm cannon in underwing gondolas, but visibility for the pilot was deemed unacceptable and, after re-engining with a 900hp Gnome-Rhone 14Kfs, the sole prototype was relegated to the role of parachute testing as the Loire 45 LP1. It flew in this form for the first time in July 1935.